"On 6 April 1965, the Prime Minister, Harold Wilson, announced the cancellation of the TSR.2 in the House of Commons. The Secretary of State for Defence, Denis Healey, explained that the government had been very reluctant to do so, but that the cost of the TSR.2 program was becoming an "intolerable burden", because the total cost of 750 millions pounds amounted to 5 million per aircraft, assuming a production of 150 aircraft. Such an expenditure, he declared, could not be cost-effective. He added that even the best efforts of BAC and the government could not provide any "assurance that the Government's ultimate financial responsibility would be limited". 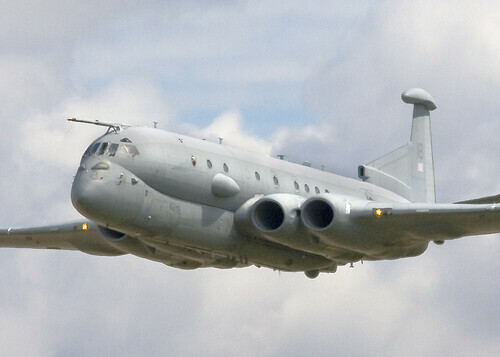 "The decision not to bring the Nimrod MRA4 into service announced by the Prime Minister on 19 October was difficult,owing to the nature of the military tasks to which it was designed to contribute,the amount of public money that had been spent on it,and the impact of such a decision on the people who have dedicated their careers to delivering this capability,or who depend on it for their livelihoods. However,the severe financial pressures faced by the nation and the urgent need to bring the defence programme into balance meant that we could not retain all our existing programmes,and that we had to prioritise those capabilities that we could continue to maintain. This project has suffered from repeated delays and cost overruns. But it is the aircraft's future support costs that contributed to the decision not to bring it into service,despite its advanced state. I suggest that history will show this in the same light as TSR2's demise. Now although Nimrod is based on the ancient Comet platform and not the cutting edge held by the TSR2 one other factor is similar. Whereas The USA benefited financially from the botched replacement bung programmes, now it will be The EU puppeteers that will have been back handing left right and centre. One thing is for certain, it will not be as simple as stated by Wilson/Healey and now by Pseudo Dave/Luff. Mind you, TSR2 looked the business, MK4 Nimrod, ugly as an a/c can be! Not ugly but striking. With a personality too. You had to know her to appreciate her (and she was a her - at the risk of being houndedby the meeja foe sexism). However, at least three disbandment parades to go to this year. Still as long as Bomber Command is preserved, eh? Hi, Sniper. Thanks for that. In fairness I thought the B737-400 an ugly bi*ch but was a joy to fly! I've been quietly seething and developing the right hump all day over this OR. Surely this is treason? And no, I'm not being deliberately provocative - I mean it. There is no rhyme or reason to this decision, no logic. Cameron and his fellow turds must be extremely sure of themselves even to think about getting away with this. Who is backing them? Their fellow conspirators in the EUSSR that's who. Well - that's the Senior Service debollocked, now the RAF... How long will it be before we hear about how the Army is to be decimated? Perhaps we'll hear again about how They will merge the RM and the Paras [are you reading this Captain Haddock? :-)] or RAF SIB with the redcaps and naval provost (hehehe!) - whatever it is you can bet that it will be something ill thought through, nonsensical and bloody expensive. Politicians - To the Tower with the lot of them; and gag the buggers for the first week just so's we can have some peace and quiet. The Tories scrapped the MK3 Nimrod in the 1980's after spending billions on that white elephant. It looked scary. Now they're scrapping the Mk4 Nimrod after wasting billions again. What is it about the Tories and incompetent procurement programmes ? Don't forget the Westland Helicopter and the SA80 rifle scandal aswell. They're pulling the teeth......one at a time. It's not so shocking nor traumatic that way - pull a tooth, recover, pull a tooth, recover - until in the end there are no teeth to pull. If we're toothless, we have to rely on the EUSSR - another hook to keep us in. Behind the scenes are quiet and significant deals taking place for the procurement of kit and uniforms, aircraft and weaponry for an EU defence force. This is all part of this terrible federal grab. I though the logic was that they've got one aircraft for nearly twenty years work and four billion quid, and they could have had a couple of dozen P-3 Orions several years ago for a fraction of that cost. I'm sure someone's thinking of asking the Yanks to lease a few P-3s to keep the UK going until they can get some P-8s. And to be fair it's not all the Tories' fault even though they ordered the thing in the first place. Let's not forget that most of the money was spent under Bliar and McSnotty. AE, very concise, as ever! Bloody hell. Not often I'm accused of being concise. My wife will be wondering who I am and what I did with the real Angry Exile.